For the price, you cannot beat this rug. Of course anything wool and tufted sheds, but this rug looks so much more expensive than it was. The colors are muted and I would say look a little lighter in person, but if this is the look you have going on, this rug will do the trick. Simply gorgeous! Nourison India House Charcoal Ivory Traditional Area Rug - 6'6" x 9'6"
Nourison India House Charcoal Ivory Traditional Area Rug - 8' x 10'6"
Protect your hardwood floors inches high-traffic areas with this elegant and charming wool rug. The traditional style of this hand-tufted oriental rug brings a touch of class to any room. The beautiful colors on this gorgeous rug are subtle and neutral, allowing for use in a variety of decor schemes. 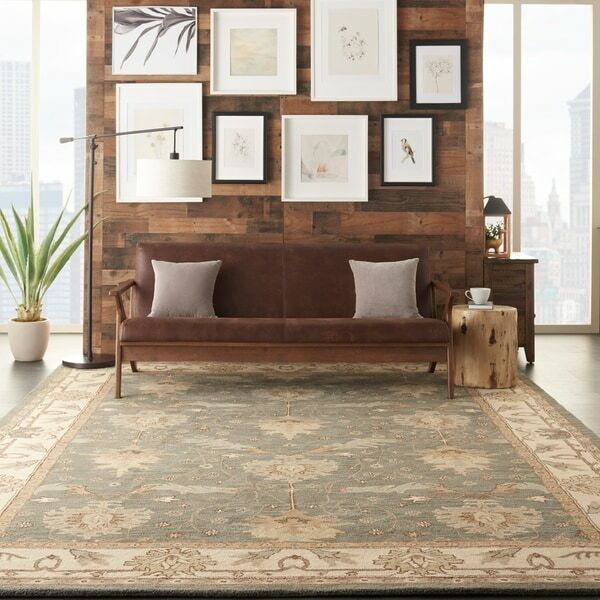 Made of 100-percent wool pile, this Nourison rug has an increased ability to repel dirtand stains. Dimensions 27.0 In. X 8.0 In. X 8.0 In. Could not be happier with this rug! Thank you to all of you who gave positive reviews to this rug. It gave me the confidence to order and I couldn't be happier. I had seen this rug advertised in another catalog and the picture was very green. I was a little worried about the "blue" in the description. I don't have a lot of blue in my house. But we were redoing the entire room, so I took a chance. Please note that the blue is really a slate grey. We have a bluestone hearth on our fireplace and I would say the stone is actually slightly bluer than the rug. The rug Incorporates tans, browns, greys, and light sage greens. Will match well with many different fabric and wood colors. It is very thick and soft and laid completely flat as soon as it was put down. I have had no noticeable shedding or odor. Love, love, love it! I ordered this rug after looking exhaustively for wool, Persian-type rugs in shades of blue, which are nearly impossible to find. I had read all the reviews for this item and figured if it arrived and it looked more gray than blue, that would be okay too. So....I just rolled it out yesterday. While it is an absolutely lovely rug, and if you're looking for muted tones in blues it's a winner, it is not perfect. Let's start with the pattern. 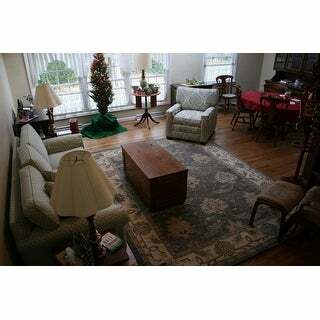 The photo shown (with 3 medallions up the center) is not what is on the large-size rug. That's the photo of the smaller version of this rug (which I also purchased). The actual large one has 3 rows of 3 medallions. The overall idea is the same, just thought I would mention. As for the color, it is definitely blue, but with gray undertones. The palette is much softer than the online photo indicates. The photo makes the colors look more saturated than they are IRL, it looks almost navy online. But it is not. I was hoping to be able to upload my own photos but looks like I can't. The most important thing to know about the color is that the large areas of blue are striated. That means they are not solid, there are variations in the color. Almost an aged or abrash look. Like denim. This doesn't bother me, but it might bother some people. This rug sheds like crazy. I vacuumed it SEVEN (yes, 7) times and it filled the canister of my vacuum to overflowing. After that, I got mad and gave up. I'm hoping that subsides with time, but I was disappointed in so much shedding. I've bought many large wool rugs from several places and none has shed like this one. I also noticed that I had more pulls in the rug than what I expected for the price. I snipped them off, but I wasn't happy to see them, and I'm hoping I don't continue to see pulls after every vacuum. This rug is so beautiful. The colors are exactly as pictured on my screen: denim blue, chocolate brown, oatmeal, soft aqua, khaki. I love the traditional pattern paired with the updated, modern color scheme. The blue base color has a variegated, watercolor look that is not as prominent in the picture but actually quite lovely. After two months, the rug is still shedding quite a bit and needs to be vacuumed around three times a week to keep the kids' clothes from being covered with tiny wool fibers. Hopefully this subsides, but I am thrilled with the look and feel of the rug. (I have the Durable Carpet Pad under it, cut to size from 8x11). I will also say I can feel small knots in the rug in a few places, which can be a surprise when walking along but have not noticed any unravelling or problems otherwise. Overall, due to its beauty, large size, and reasonable price I consider this rug a great purchase! Nice wool rug, quality is good for hand tufted, colors are beautiful and very hard to find in a traditional style rug. Well packaged, 100% wool, high quality rug, dense pile, so far no shedding, colors as shown. Perfect for the area I have to cover. Simply rolled the corners in reverse direction to make rug lay flat. 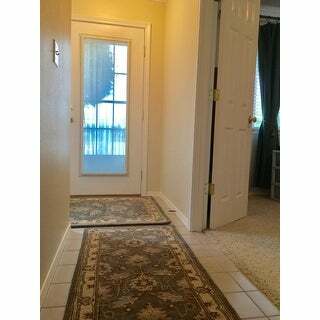 I recommend the thin, non-skid pad if the rug will be placed near a door that will open over the rug. The pile is luxuriously thick. Our doors ever so lightly brush over the surface of the rug. Imagine this will diminish as foot traffic compacts the new pile a tiny bit. Am very happy with this purchase! This rug is a very thick wool rug with muted blues and some sage in it. The colors are just what I was looking for and the price was fantastic. I started with the smaller rug to make sure the colors were right before progressing to the large area rug. I am sold on the quality and colors. Highly recommend this item. It has been dog approved at my house. I can't believe how wonderful this rug is. The quality, thickness and durability is all there for such a small price. It is not a bright colored blue rug nor a true blue. The picture is accurate, not the description. Thankfully someone else had reveiewed the rug prior to my purchase. I needed more of a slate/steel blue rug than a bright blue, so this rug really works for my room. It is a very thick wool pile and well made. There are no pulls, peels etc. The backing is canvas and I really believe this rug sells for upteen times the O price! .I have vacuumed it a number of times, I own a Dyson, and it is not "shedding" as many other thick pile wool rugs from Overstock have done in the past. I am thrilled with this rug!! Delivery was super fast...I can't say enough great stuff about this rug. Rug has nice pile, the blues are muted and look great with the taupes in the rug. Blue oriental type rugs are hard to find, and this one is tasteful and expensive looking. Great rug for the money. We needed a thicker,brighter rug to cover our dark and cold bamboo floor-the rug we had was a typical poly rug that had no thickness. This Rug was exactly what i wanted;the color is perfect,tonal light blues,cream and beige.I actually saw a rug in a major home decor catalog today that was almost a twin to this one-and twice the cost PLUS extra for shipping. We have this is our family room-it is constantly walked on by 2 adults and 3 large dogs-it still looks perfect. Being Wool-i have not had an issue with any major shedding;just light fluff when vaccumed. The rug is thick and will not require a rug pad if your furniture is going to be edging it.it's pretty heavy-so i doubt it will scootch around much. The rug is a great deal for the size,quality and softness.I really shopped around and this is really a great buy. This is my second Nourison Hand- tufted rug. It is beautiful and looks great in my guest room. The rug is well made and a great value. The rug lays flat immediately. Shipping was great and packaged nicely. We already had a smaller version of this rug and loved it in our family room. Amazingly, the colors and design went perfectly with our new living room furniture and wood floor. All we had to do was find the larger version, and we did at Overstock. It arrived well before the projected delivery date. We couldn't be happier! 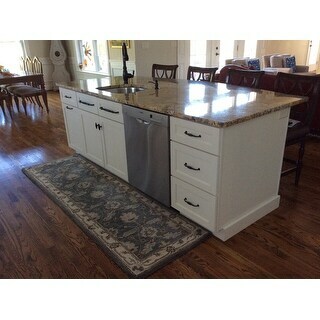 I bought this rug to go in front of my kitchen sink/island. It is the right size and is a thick wool. The blue color is very soft, not bright. You can't go wrong for the price! This was a very good purchase. It is thick, the color is perfect, blue,green,grey would be my best description of the basic color. I use it in my entry and it does a great job of protecting my floor and looking good. IF YOU ARE LOOKING FOR BLUE THEN THIS MAY WORK OR NOT. 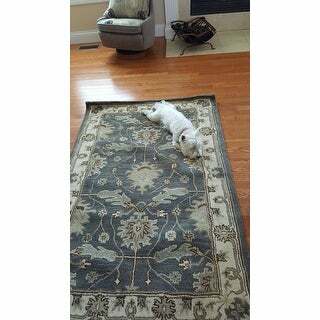 RUG IS VERY NICE, DOESN'T SHED, SOFT TO TOUCH. NOT LIKE SOME WOOL RUGS THAT ARE HARD AND THE FIBERS SHED LIKE A DOG. THE COLOR IS SOMEWHAT GREENER THAN EXPECTED. LIKE A MEDIUM DENIM WITH A GREEN CAST TO IT. I AM KEEPING IT BECAUSE MY FLOORS ARE DENIM COLOR HARDWOOD AND MY HOUSE IS BLUE AND GREEN SO THESE WILL GO PERFECTLY WELL. UPDATE: This rug sheds like a dog. I am serious here. Its been shedding horribly for three long years. It’s going to goodwill as soon as I purchase another rug for the hall. The runner is very nice. The colors are a little more muted than they look in the image. It's thick and soft. We like it a lot. This rug looks much more expensive than it is. It has enough muted and beautiful colors that I can't imagine any room that it wouldn't compliment. The "blue" is actually a gray, but looks great, so there is really nothing to cause me to give it ant less than 5 stars. Beautiful colors and pattern. Plus 100% wool--it's gotta have like 5 sheep in it, so thick and soft. Pet hair doesn't stick to it. Looks great in our living room as the colors are so neutral and soft. Beautiful Rug! Outstanding quality. Relied on others reviews and they were spot on. This rug looked nice at first, but after about 2 years we noticed that fibers had become loose under any chair or table leg. So not only did it shed like crazy, but fibers came off in chunks. I don't know when this started happening, but we noticed it at about 18-24 months. We ended up giving this to charity. Gorgeous high quality rug. Bought for our store and I think it will wea well. Fast shipping. Arrived in perfect condition. Pretty greys and blues. Overall blue-gray shades are a beautiful kind of neutral. Quality rug with a substantial felt pad give a luxury feel. I am so pleased with this rug. Very little shedding. Love this rug. More of a steel gray than blue. Very plush and thick. I love thick hand tufted rugs. Yes, it sheds a little but stops shortly. Would order again. "What is the return policy on this rug? Just in case color might not be right." "Is there green in this rug? Hard to tell from pictures. I need slate blue but also some greens in a new rug." Yes there is slight sage green detail in the blue colored rug. "is the Caspian Blue close I. color to the Traditional blue"
The color is closer to a lighter blue/grey. "Is the color blue or is it gray? Some pictures show more gray than blue but the description says blue." This rug is a light blue. We are working on adding better images to show the correct rug. This rug also comes in a dark charcoal color if you would prefer that. "Love this rug! But to really look right in my dining room I really need a 8x11? No chance on getting that size or even ordering that? Thanks, Lisa"
This rug is available in an 8 x 10’6” size. The item # is 12720092. I hope it helps. "what is the main color. it says blue, but it looks grey to me." This color is a deeper shade of blue/grey. "How much does this rug weigh in 5 x 8? Where is the weight listed for the various sizes?" The weight of this rug is 31 lbs.